It's time for phase two of our latest Kotaku Co-Op where we're deciding what you think is the best graphics card for the money. Remember, it's not just about power, it's about value. Unlike previous Co-Ops, the nominations this time were very much concentrated around these five choices, and it should be a close vote to watch play out. 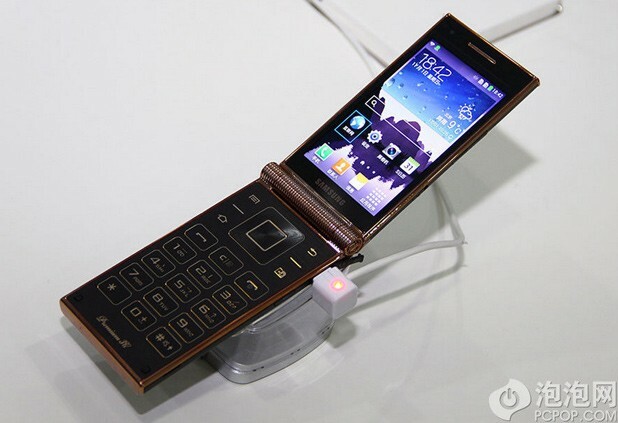 China Telecom's obsession with Samsung's luxury clamshells isn't dwindling any time soon. In fact, the two companies have just launched a new model, the SCH-W2014, at their annual "Heart Of The World" charity concert in Nanjing last night. 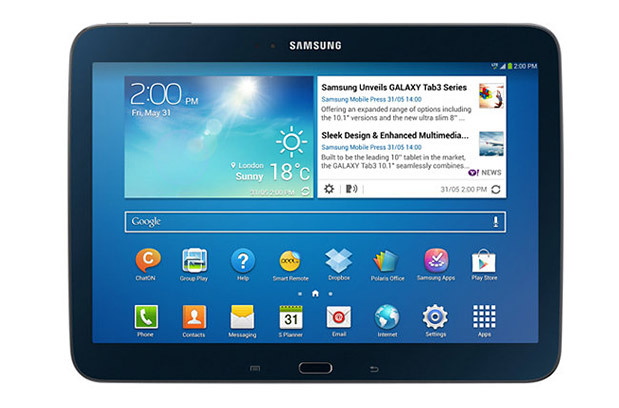 While it shares a similar appearance with the W2013 and the more recent Galaxy Golden, the new W2014 is by far the most powerful dual-screen flip phone in Samsung's line-up, featuring Android 4.3, a 2.3GHz quad-core Snapdragon 800 SoC, 2GB of RAM, a 13-megapixel main camera, a 2-megapixel front-facing imager and dual-SIM connectivity (CDMA2000 800/1900 and GSM 900/1800/1900). You'll also find 32GB of internal storage plus microSD expansion. Compared to the Galaxy Golden and the W2013, the only notable downsides on the W2014 are the same 800 x 480 resolution on its 3.7-inch Super AMOLED displays, as well as its similar 1,900mAh battery capacity (but removable). 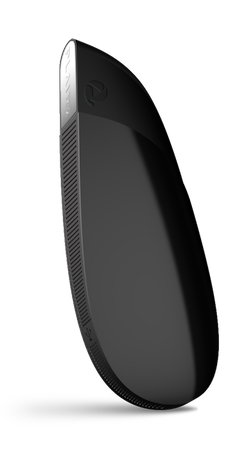 On the flip side, the weight has gone down to 173.5g, making this the lightest model in the "Heart Of The World" clamshell family since the W699 -- the first of the series -- from 2008. Chinese website iFeng praised the phone's overall design and keypad feedback, but criticized the plastic look and feel of the hinge. There's no solid launch date or price just yet, but expect the W2014 to cost beyond CN¥10,000, which works out to be about US$1,640. Head over to PCPOP for more hands-on photos. 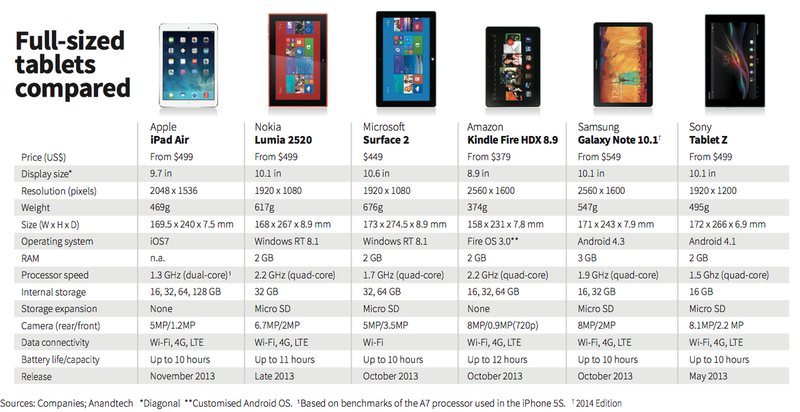 Anyone in need a full-sized iPad that's lighter than last year's model can start hammering Apple's online store now. 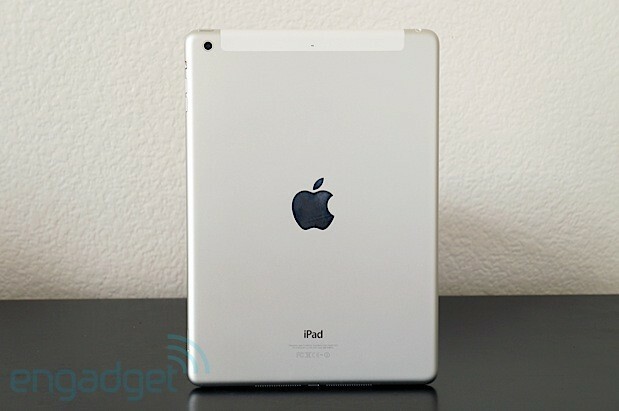 The new iPad Air is now on sale, marking Apple's biggest tablet launch yet. Starting with Australia, by the close of November 1st, it will have landed in 42 countries, and you know what? We kind of liked it. Online orders can be placed at the source link, or you can visit your nearest Apple retailer in person for instant iPad gratification. Ubisoft has sent its online pass program to Davy Jones' locker following players' complaints over gated content in Assassin's Creed 4: Black Flag. Before, if players wanted to access the game's online multiplayer features, companion app and related bonuses they would have to input a single-use code that came with new copies of Black Flag. Not any more, though. The French publisher has completely scrapped the Uplay Passport system from all upcoming games and is providing free codes via Xbox Live and PlayStation Network for players who don't have one (e.g., because they bought a used game or borrowed it from a friend). With Electronic Arts dropping its online pass system earlier this year, Sony doing the same for its first-party software and Ubisoft finally following suit, one of the game industry's more awkward experiments could finally be behind us. You're probably used to hearing about drones as these scary, deadly things causing chaos in Pakistan, but the scientific community is actually pretty pumped up about the technology. Why wouldn't they be? 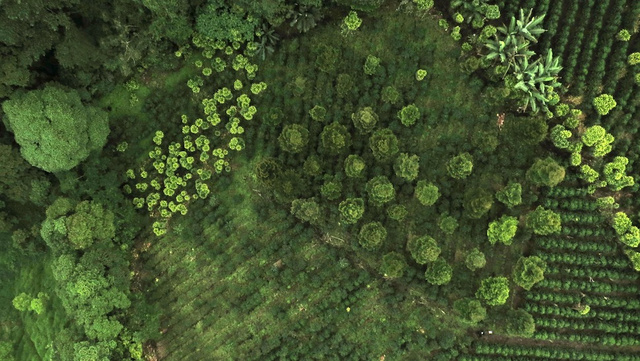 Drones can makes 3D maps of mountains. Meanwhile, Firefox Beta added "Click to Play Plugins" on Linux, Mac and Windows, meaning that "most" plugins (Flash is an exception) will no longer be activated on their own. Firefox says providing the option to choose the ones you would like to enable was key, as outdated plugins are a big source of security vulnerabilities. Rounding things up on the desktop is the Firefox OS app manager, a novel tool for developers to test and tinker with those HMTL5 apps straight from the Firefox browser. All that sound good? Then follow the source links below, where you'll find a way to download each variant of the experimental application. In the months since information about the NSA's bulk surveillance efforts began to leak, many of the tech companies named in documents have been unable to even discuss their involvement. Those blinds have been pried back a little with the release of a few transparency reports, but today Google, Microsoft, Facebook, Yahoo, Apple and AOL (the corporate parent of Engadget) sent a letter to Congress encouraging it to do more. Mashable posted a copy of the letter (embedded after the break), which is addressed to members of the Senate Judiciary Committee and specifically references the recently-introduced USA Freedom Act as an "important contribution" to the discussion. That particular bill seeks to end the NSA's "dragnet" security programs while "requiring greater oversight, transparency, and accountability with respect to domestic surveillance authorities." According to the companies, greater transparency would clear up "erroneous reports that we permit intelligence agencies "direct access" to our companies' servers or that we are participants in a bulk Internet records collection program." As the Washington Post points out, the companies listed may take issue with other bills circulating like the FISA Improvement Act because they don't address surveillance of non-US citizens, creating suspicion and problems for said companies setting up services for users internationally. "Okay Google." Those Touchless Controls aren't just for the Moto X anymore -- they're now part and parcel of the Nexus 5. With today's unveiling of Google's (terribly leaked) Nexus 5, we're getting a first look at Android 4.4 KitKat on the handset, and that OS update comes with some significant tweaks to Search and Now. For starters, Nexus 5 users will have the ability to set hot keywords as a means of activating or "waking up" Now voice search. So, presumably, this means you'll be able to link any word you'd like to start barking voice commands at Now. Just don't be surprised if Now talks back to you: KitKat also apparently allows for a dialogue of sorts between users and the handset to refine search queries. This could be especially useful when directing Now to access contacts by first name. For example, saying "Text Jennifer" could result in it asking you to specify, "Which Jennifer?" It's smart control made smarter. But that's just the tip of the improvements Google's made to its Now and Search product. Overall, speech recognition is said to have been made 25% more accurate and manual access to Now can be triggered by a swipe to the left (Nexus 5-only, for now) -- no longer a swipe from the bottom of the screen up. Now has also been outfitted with a wider array of "contextual cards." It's yet another step in making Google's digital assistant even more prescient, as it will now display information based on a user's current activity, like Fandango for ticket listings if you're at a theatre, or even updates on a favorite TV show you've searched for previously. And going even further, Google Now will also provide "deep links" to applications you've installed on the handset. In the use case Google provided, this means that a recipe search won't just display link results, but will also ping up the AllRecipes app or even OpenTable, if you're on the hunt for a restaurant. Though all of these Search tweaks are bundled into the Nexus 5 for now, they should soon rollout to other Nexus devices as Android 4.4 KitKat is made more widely available. Last year, Google unveiled a new wireless charging pad alongside the Nexus 4 and Nexus 10, and the company has taken advantage of 2013 to come up with another one. 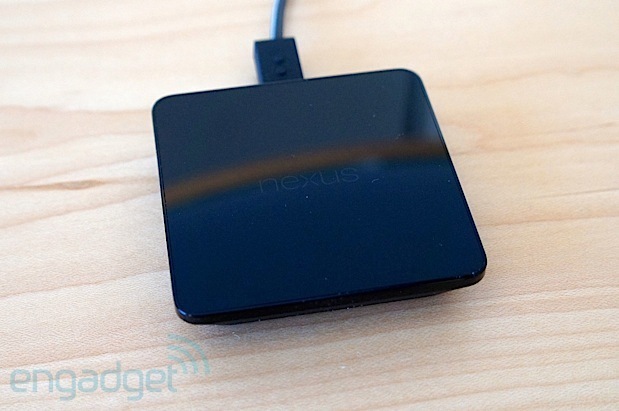 This new charging pad has been announced in tandem with the Nexus 5, and will include support for it and the Nexus 7. It's supposed to go on sale in the Play Store today, though pricing is still an unknown. So what's different this time around? The new pad, which should work with any device that offers Qi compatibility, has been completely redesigned (it's shaped like a square instead of a hockey puck) and now features magnets that will make it easier for devices to stick on it -- provided those phones and tablets in question have magnets built in as well. We'll have more information about the chargers as we get it, so stay tuned! You'd think that given how pervasive the internet is, we'd be stuck with the fundamental architecture it uses: servers that many devices connect to for their information fix. But a team of Cambridge University scientists wants to shake things up—and remove servers altogether. You might see more (good) phones and tablets with Intel inside, now that the company has started shipping its new LTE-capable XMM 7160 chip to manufacturers. We say "new," but it's actually been a long time coming -- the company first revealed the radio in early 2012 and officially announced it in February this year. 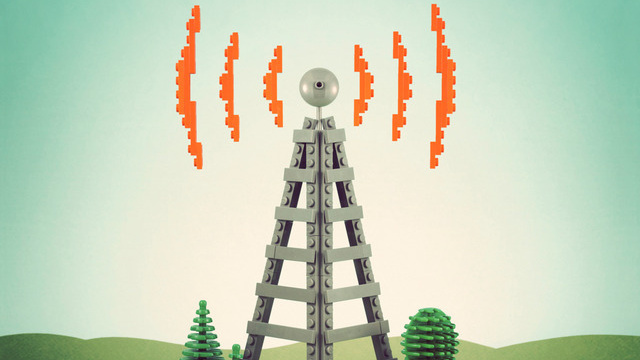 Since the modem supports not only 15 global LTE bands, but also 2G, 3G and voice-over-LTE services, it could potentially give Intel the boost it needs to start fulfilling its mobile ambitions. 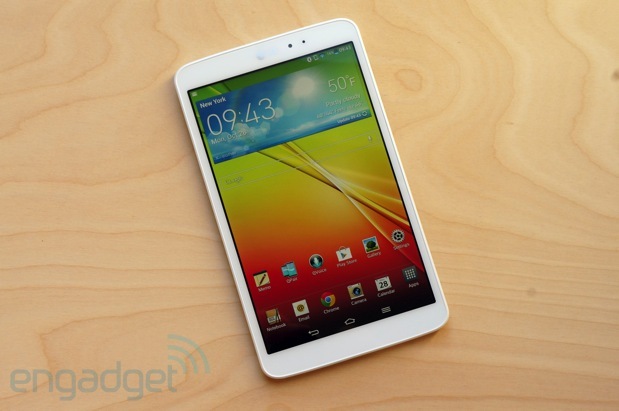 The chip's already begun its journey within the Samsung Galaxy Tab 3 in Europe and Asia, and it'll come with other Bay Trail tablets in the future. We may compare Panasonic to the character of Michael Myers way too often, but this Halloween the analogy is particularly relevant given news the company is officially killing plasma TV production. Manufacturing of plasma panels will end in December this year, earlier than the most recent rumor suggested, with the last remaining factories going dark in March 2014 at the same time sales efforts will cease. It's a strategic decision to free up resources, the firm claims, citing low demand for plasma and the impact of LCD development as reasons for its exit. 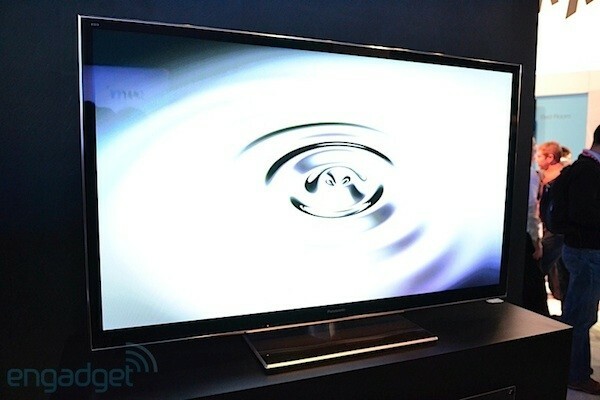 "Severe price competition" as a result of the Lehman Brothers collapse way back in 2008 is also blamed, so when you're left wanting the warm glow of new Panasonic plasma next year, you know who to shake an angry fist at. Google has a lot of free fonts on offer, but it's hard to know how they'll look on a website without putting them into HTML code or buying a preview tool. It's now much easier to experiment with typefaces, however, as Google Fonts has just integrated a typography app. Designers can click a link to test a given font in a free, lightweight version of Monotype's Typecast; from there, they can try out new color combos, effects, sizes and weights. Those happy with their work can export code and save images, and they can subscribe to Typecast's $29 per month premium service if they need to create style guides or offer live web previews. 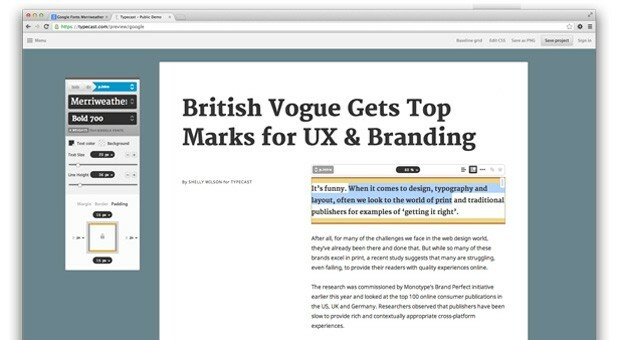 Page creators only need to visit Google Fonts to start tinkering with their text. We learned some big news from Facebook's earnings report: Teens are officially leaving Facebook. We already knew that Facebook was no longer the most popular social network for teenagers, but we now have confirmation from the company itself. Facebook CFO David Ebersam said that although youth engagement on the social network is hard to measure, there was definitely a decrease in daily users among younger teens in Q3. "This is of questionable significance," Ebersam said, "But we wanted to share this with you now because we get a lot of questions about teens." Ebersam added that Facebook remains "close to fully penetrated" among teens in the U.S., meaning just about every teenager is already using Facebook there. As we all desperately claw after more bandwidth to sate our unquenchable thirst for data, there may yet be an oddly affordable solution; a simple piece of circuitry and software that can double bandwidth in the blink of an eye. After putting its rovers on Mars, Nasa's Jet Propulsion Lab showed the world that billion dollar hardware isn't always the answer. And researchers at the EPFL are taking the same technology-on-the-cheap approach with a low-cost autonomous flying drone that simply bumps and crashes into everything in its path instead of relying on expensive sensors and software to avoid obstacles. 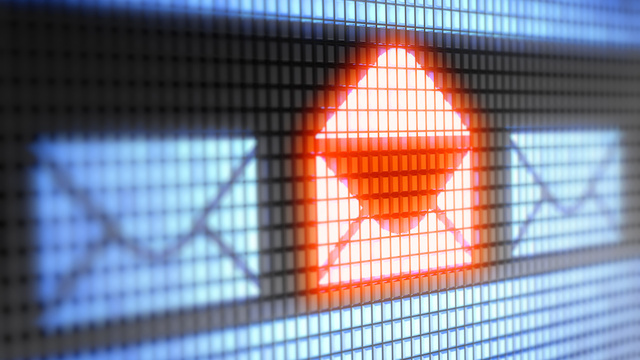 In the wake of the Edward Snowden leaks, we've seen at least two encrypted email services close shop in the face of government scrutiny. They're not giving up on the mission, however. In fact, these freedom fighters now say they're coming back twice as strong and twice as committed to shutting out the NSA. 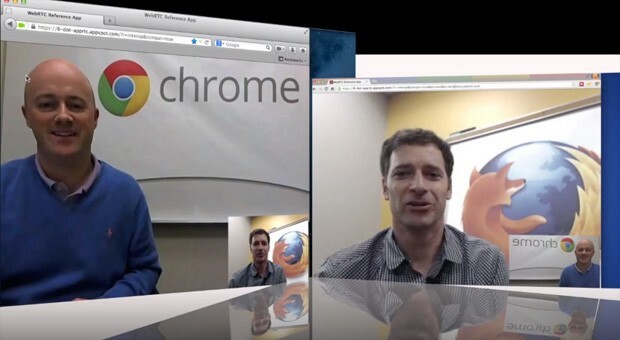 WebRTC promises plugin-free video chat in our browsers, but it has been stuck in limbo due to format squabbles -- some companies want royalty-free standards like VP8, while others insist on the wider support of H.264. Today, Cisco is proposing a truce between the two camps. It's planning to open-source its H.264 codec without passing on the royalties it pays to MPEG-LA, effectively making the standard free when used in web conversations. Mozilla is endorsing the strategy; although it still prefers open video technologies like VP8 and Daala, it believes that Cisco's move would let both Firefox clients and Firefox OS use H.264 for more tasks. Nothing is set in stone at this point, however. Industry members will pick WebRTC's video standard on November 7th, and there's no guarantee that their choice will dovetail with Cisco's plans. If all goes well, though, we won't have to fret much over the apps and devices we use for our video discussions. Valve's Steam service for PC distribution and sales has over 65 million users playing its over 3,000 games, the company announced this afternoon. That's a 30 percent increase (15 million accounts) over the last 12 months -- not too shabby! -- putting the service's userbase well above that of Microsoft's Xbox Live (which has 48 million, according to MS). Not quite the 110 million that belong to Sony's PlayStation Network, but not too shabby. The new Steam number comes ahead of Valve's planned hardware beta, which intends to test the three main components of the company's big living room push: SteamOS, Steam Controller, and Steam Machines. 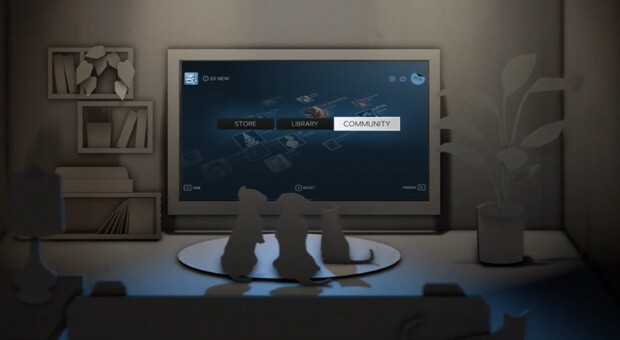 The first of those components, SteamOS, is a Linux-based navigation solution for gaming PCs in the living room. While in can be installed on any PC (and it's free), it'll come installed on the physical Steam Machines that Valve ships to 300 beta participants (alongside the aforementioned Steam Controller). That said, at 65 million users, you have 0.0005 percent chance of being chosen for the beta. Best of luck with that! 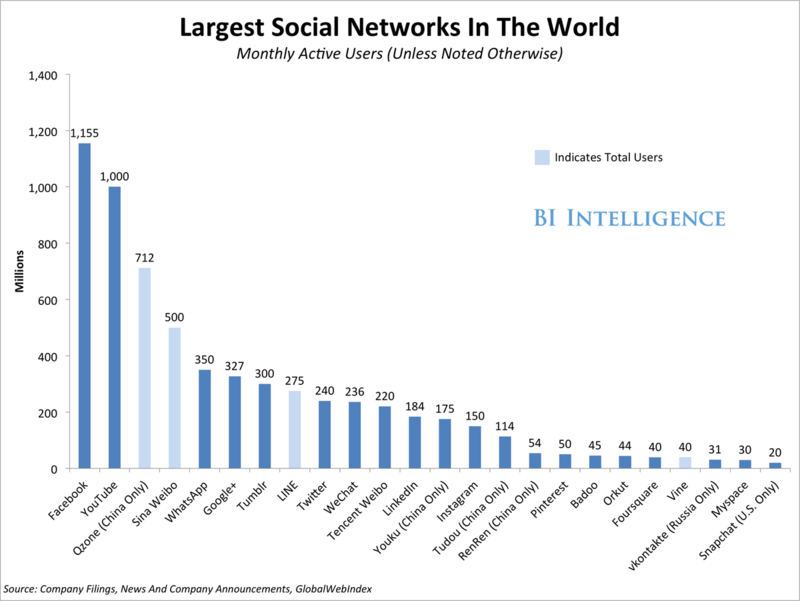 A Census Of The World's Social Media Networks: Which Are The Biggest, And Where Do Their Users Come From? Our census, which used a liberal definition of social networks, yields a few widely known but many surprising facts. Facebook still has the largest user population at 1.16 billion monthly active users. But it's seldom-discussed that YouTube is close behind with 1 billion MAUs. Social media professionals should understand not only how large each network is, but the countries of origin of the people who populate them. For example, 86% of Facebook's users are outside the United States. Facebook's new center of gravity is in emerging markets. Facebook has 95 million users in China (despite the fact that it's officially blocked), 68 million in India, 42 million in Brazil. Taking these population together, they're twice as large as Facebook's U.S. population of 100 million. 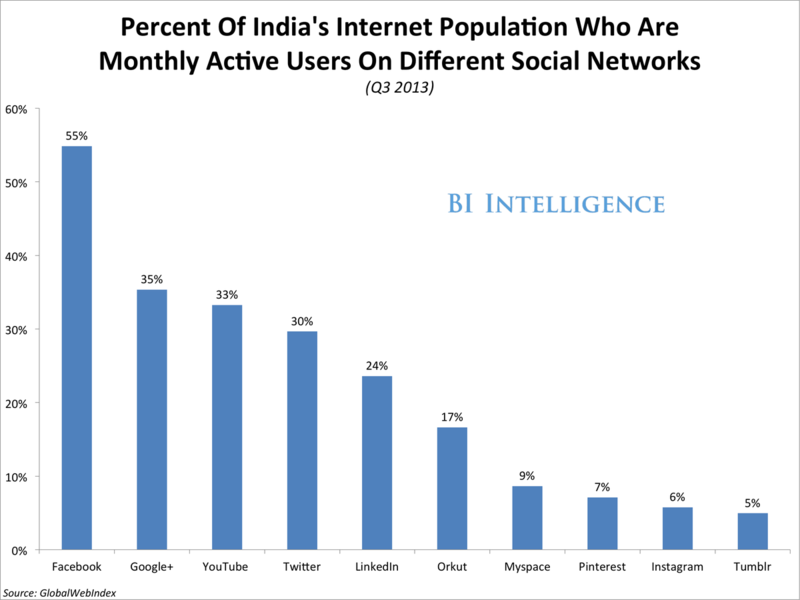 Nearly 25% of LinkedIn's users are in India. In fact, there are more Indians than Americans on LinkedIn and Google+. Since India and the U.S. both have English as a principal language, there is bound to be a great deal of shared activity. LinkedIn, the only major social network that is not blocked in China, has more than 20 million users in the country. Asia-Pacific overall has more active social media users than any region, and Southeast Asian markets such as Malaysia, Indonesia, and Vietnam are off the charts when it comes to mobile social media usage. Eighty-two percent of Thai smartphone owners access social media daily on their phones. Social media transcends geography, and it's important to understand the sheer scale and diversity of audiences on the world's largest social networks. In this report, we compare the world's largest social networks in two ways. We first evaluate the world's largest social networks side-by-side in terms of total audience size. That yields some surprises, such as the fact that YouTube ranks as the world's second-largest social network, that WhatsApp is bigger than Google+, and that China's Qzone is about the size of Twitter, LinkedIn, and Google+ combined. Then we analyze the markets where each has the most growth potential. You might not be familiar with every major social network on our list, as some are active in just one country and closed off to the rest of the world (as is the case with social networks in China and Russia). Nonetheless, some of these closed-off social networks have an audience size that rivals that of Facebook, Google+, Twitter, and other popular mainstream social networks. One of the most surprising facts unearthed in this research is that audiences in certaiun Southeast Asian countries like the Phillippines, Indonesia, Vietnam, and Malaysia are extremely active on social networks, particularly on mobile devices. 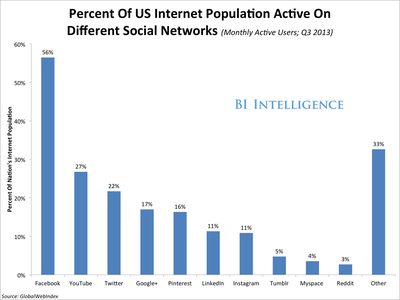 In aggregate, these markets present a huge opportunity for established social networks and mobile-first social apps. We also identify the main developing and emerging markets where mainstream social networks will have the most growth potential. LinkedIn still has plenty of runway for growth in Western Europe, while Facebook will see the most growth in Latin America and Asia. Facebook reached 1.16 billion monthly active users at the end of the second quarter this year, and 71% of those people were mobile monthly active users (meaning they accessed the social network on a mobile device, but may also log in via a PC). MAUs in North America accounted for 17% of total MAUs, and are growing at an average rate of 2% each quarter. North America, dominated by the U.S., made up 47% of Facebook's user base just five years ago. MAUs in Europe accounted for 24% of total MAUs, and are growing at an average rate of 3% each quarter. MAUs in Asia accounted for 29% of total MAUs, and are growing at an average rate of 8% each quarter. MAUs in all other regions, including Latin America and Africa, accounted for 30% of total MAUs and are growing at an average rate of 8% each quarter. Fifty-six percent of Internet users in the U.S. are monthly active users on Facebook, according to a GlobalWebIndex survey of more than 16,000 people. Pew Internet Research says that 67% of Internet users in the U.S. use Facebook, though not necessarily every month. Putting Pew's number together with GlobalWebIndex's, we see that over 80% of Facebook's U.S. users are active monthly, an enviable level of engagement. Nearly 87 million Internet users from mainland China use Facebook, accounting for 8% of Facebook's entire global user base according to an ongoing multiyear survey by GlobalWebIndex. This is despite the Chinese government's ban on Facebook that dates to 2009. Facebook's official estimate (according to its advertising tool) pins its user base in China at 680,000. But surveys reveal that Facebook's number is an extremely conservative estimate at best. Where are Facebook's main growth opportunities? Despite a government ban, we expect Facebook's user base in China to explode in the next few years, as free speech restrictions become more lenient, the network is unblocked in certain "free trade" areas, and more people tap into the network using proxy servers which helps them remain anonymous to surveillance. Approximately 55% of Facebook users in China rely on a proxy server to access the social network. Despite being a blocked site, Facebook's user base in China is already the second largest of any country's, trailing only the U.S.'s. However, with only 21% penetration into the Internet population in China, Facebook could easily add another 100 million users from China alone over the next few years. The problem, of course, is that Facebook will probably face an uphill battle monetizing these users. Few advertisers, if any, will want to target a population that in theory is banned from using the network. Google+ launched midway through 2011, so among the largest global social networks, it's one of the more recent to come onto the scene. The importance of Google+ in the social media ecosystem is underestimated. Google has integrated Google+ with some of its most popular products and services, including Gmail, Google Search, and most recently, YouTube. Collectively, Google sites make up one of the largest audiences on the Web. 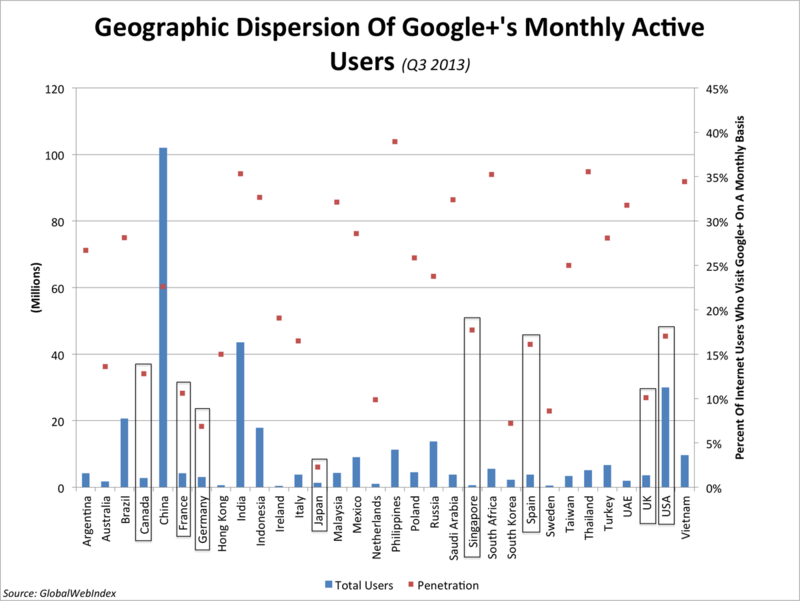 Because of this Google+'s user growth is intrinsically linked to the performance of other Google products! , as wel l as how Google positions the social network within its own ecosystem (e.g., organic content on Google+ ranks high on Google search results). There were 359 million MAUs in May 2013, up 33% from June 2012, according to GlobalWebIndex. There were 36 million MAUs in the U.S. on desktop computers alone during the month of May, a 62% increase from May 2012, according to comScore. Google reported in December 2012 that the social network had accumulated 500 million members (including non-active users). What are the growth opportunities for Google+? 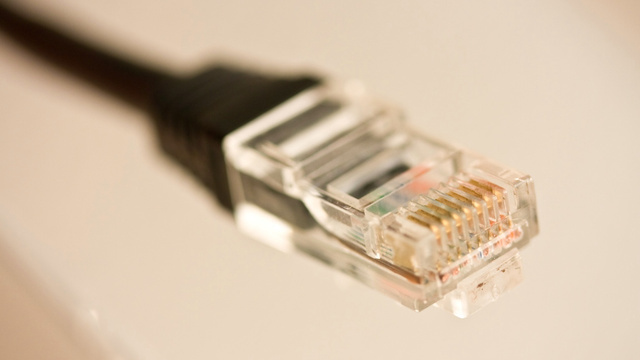 We are seeing room for user expansion in many well-developed Internet markets. For example, fewer than than 11% of Internet users in France, Germany, and the U.K. currently use Google+ on a monthly basis. The North America region also shows promise. Canada ranks 20th in the world for Internet audience size, and according to the CIRA 2013 Factbook, Canadians spend more time online than anyone else in the world. Among online activities, Canadians spend more time with social media than any other type of content. Despite this, only 13% of Canadian Internet users use Google+ on a monthly basis. The U.S. is Google+'s third-largest market (behind China and India), and yet only 17% of the country's Internet users say they use Google+ on a monthly basis, according to a GlobalWebIndex survey. Also, because Google+ is so popular on smartphones, we expect it to gain a lot of users in markets where there is a lot of smartphone usage. 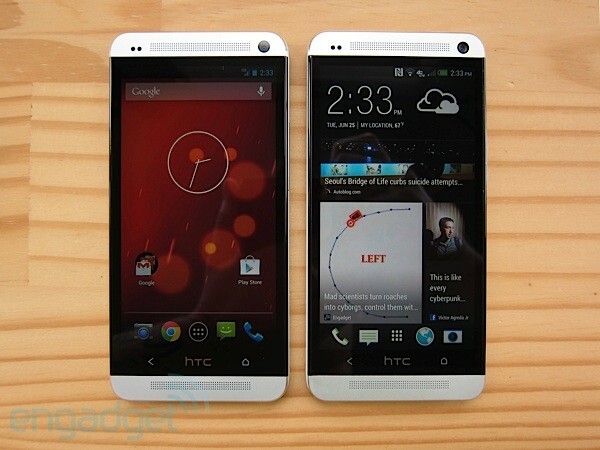 Google+ is the fourth most popular smartphone app globally, trailing only Google Maps, Facebook, and YouTube. Therefore, we see strong growth potential in several mobile-focused social media markets, including Spain, Singapore, and Japan. We also anticipate continued growth in India and in mainland China, where Google+ is already more popular than Facebook and Twitter. LinkedIn had 60 million MAUs in the U.S. in June 2013; 29% were mobile users and 16% were mobile-only. There are more than 30 million students and recent college graduates who are members, and they represent LinkedIn's fastest-growing demographic. So while Facebook is getting older, LinkedIn is getting younger. Approximately 65% of LinkedIn members are located outside the U.S. The U.S. is LinkedIn's single largest market, accounting for more than 84 million registered users, followed by India (21 million), and the U.. .and Brazil (both with 13 million). 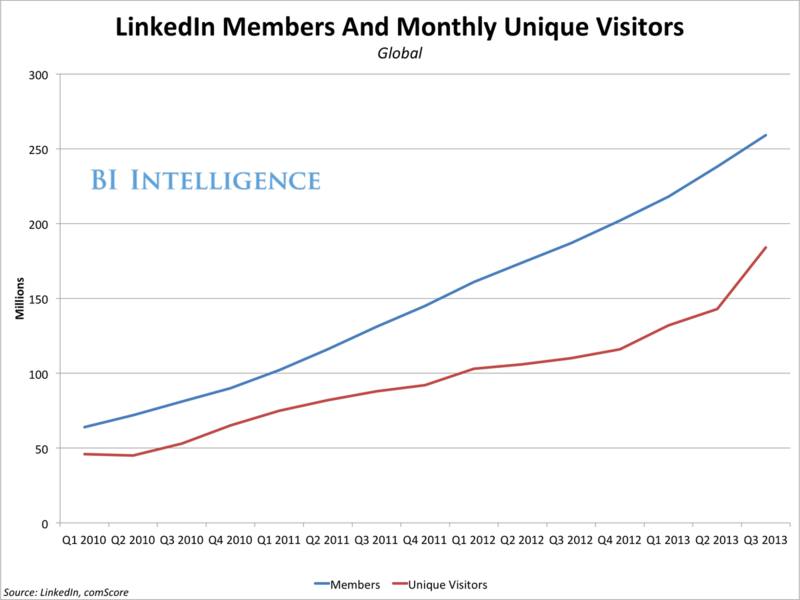 What are LinkedIn's growth opportunities? During LinkedIn's third quarter earnings conference call, CEO Jeff Weiner said that the company will have its "mobile moment in 2014," pointing to Turkey and Singapore as cases where 50% of LinkedIn's users access the site via smartphones and tablets. 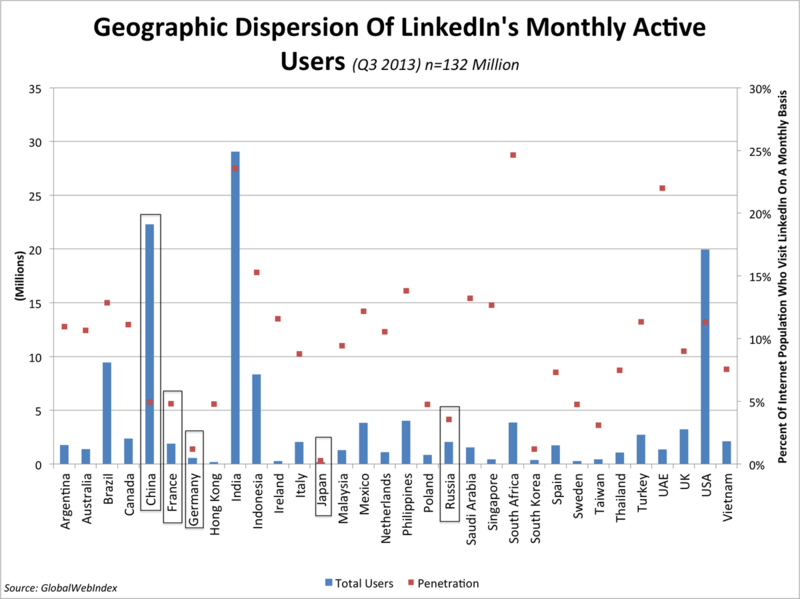 We expect LinkedIn to accumulate large aggregate user growth across many Western markets, such as France and Germany. LinkedIn has less than 5% penetration in China and Russia — two of the largest social media markets in the world — so there is a lot of headroom for growth there. Given the professional nature of LinkedIn's content, it should see more user growth in financial centers, such as Singapore and Japan, where we have yet to see any significant penetration by the social network. YouTube is localized in 56 countries and across 61 languages. Since its founding in 2007, YouTube has become the dominant video platform on the Web, reaching more U.S. adults ages 18-34 than any TV cable network, according to Nielsen. In March, YouTube reported that it had surpassed 1 billion monthly active users — 40% of whom accesses the video social network via a mobile device. 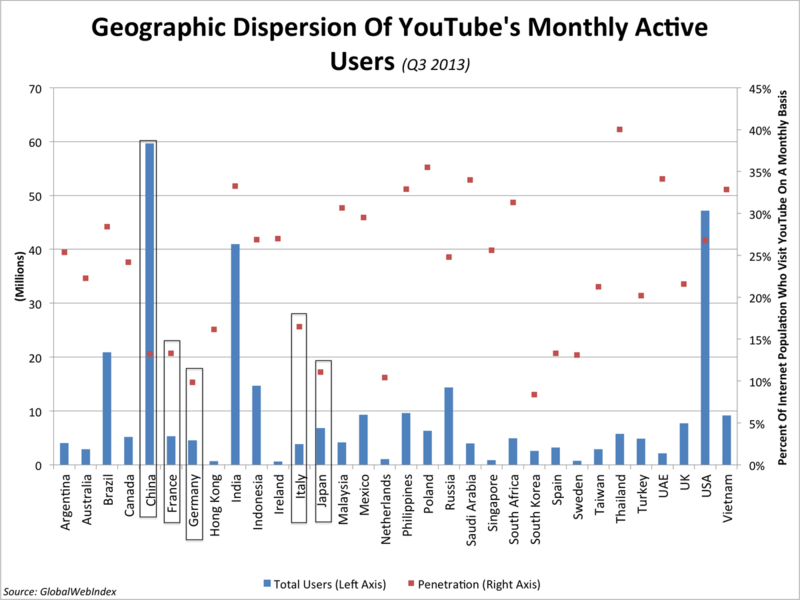 In the U.S., one in four Internet users accesses YouTube monthly. What are YouTube's growth opportunities? We expect YouTube to see growth in markets that have a high proliferation of premium mobile devices — smartphones and tablets. Thus, markets to watch for are parts of Western Europe, such as France, Germany, and Italy — all of which YouTube has 15% or less penetration in. China is a particularly exciting market for YouTube, where it currently has 60 million MAUs, but only 13% penetration of the Internet population. Also, the healthy high-end mobile device market in Japan should propel YouTube's growth in Asia. Canadians watch more videos per user than any other country. YouTube currently has a stronghold on the online video market in Canada, accounting for half of all videos Canadians watch on the Web. Total monthly active users in the third quarter were up 6% from the previous quarter and 39% compared to the third quarter of 2012. But that's a deceleration from the second quarter, when MAUs had grown 7% over the previous quarter, and 44% year-over-year. 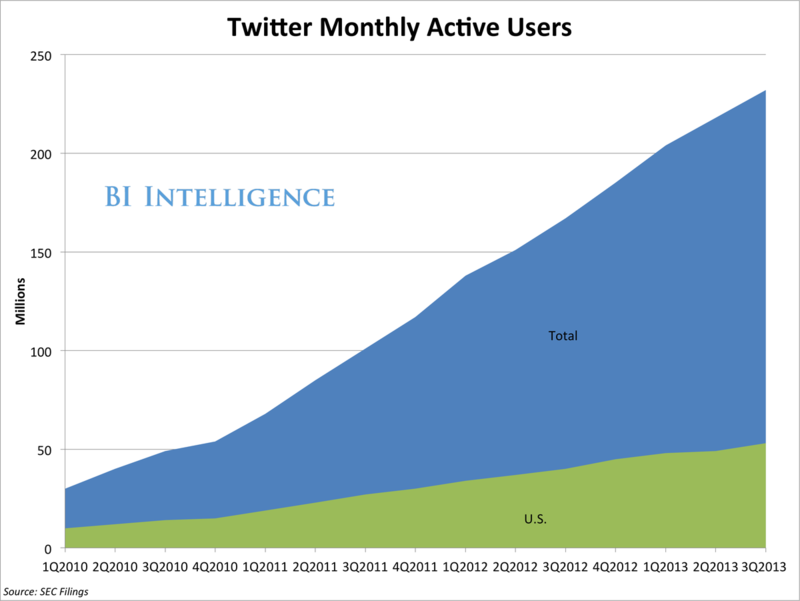 An average 232 million people visited Twitter on a monthly basis. Twenty-three percent of those visitors were U.S.-based. Seventy-six percent accessed Twitter via a mobile device. 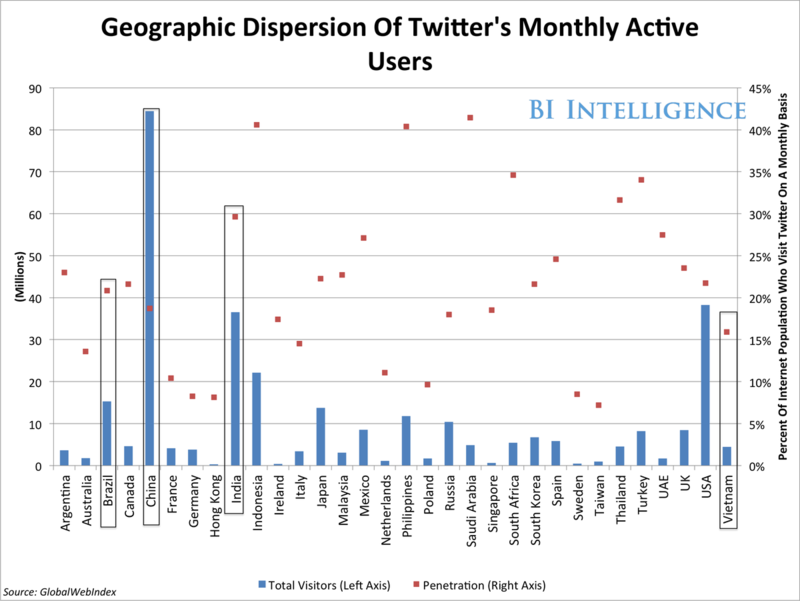 Twitter is adding new international users at a faster rate than U.S. users. International MAUs grew 41% year-over-year in the third quarter, compared to 33% in the U.S. Some of Twitter's top executives were recently re-assigned abroad to support the company's expansion into emerging markets. What are the growth opportunities? According to Twitter's own forecasts, management expects user growth to come largely from Argentina, France, Japan, Russia, Saudi Arabia, and South Africa. Twitter management might be downplaying potential in these markets because of increased competition. In China, Tencent Weibo is more popular than Twitter, and their functionality is very similar. Elsewhere in Asia, mobile messaging apps, such as LINE and WeChat could be favored for their local roots in the region, and in speaking with management from those companies, we know they are expanding aggressively in Vietnam, Taiwan, Thailand, and other markets in Southeast Asia. Before drilling down into how quickly certain markets are growing, and how heavily they weigh in the makeup of specific social networks, it's useful to get an idea of how these audiences access social media. 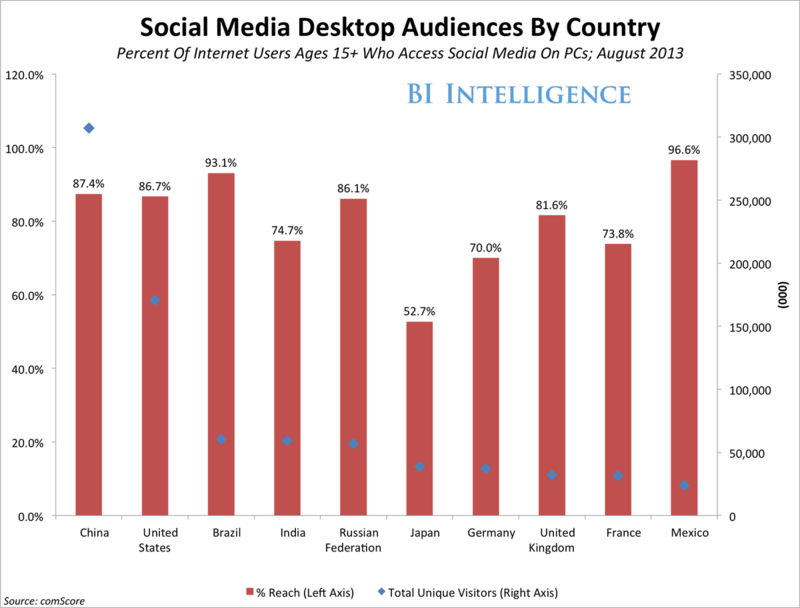 On a global scale, PCs are still the primary means for how people access social media. According to comScore measurements shared with BI Intelligence, 94% of Internet users age 15 and older in Latin America access social media on a PC. This doesn't mean that they don't also access on mobile devices, but the high proportion reveals that PCs are far from irrelevant as a tool for accessing social networks. Other world regions showed similar numbers: 87% in North America, 82% in Europe, 80% in Asia, and 71% in Africa and the Middle East. Although social media activity remains low in the Middle East and Africa, it's also the region with the most headroom for user adoption. Despite high social media penetration rates in Latin America, the social media audience on PCs in the region is smaller than that of North America, Europe, and Asia-Pacific. However, going forward we expect social media user growth to be closely tied to mobile growth around the world. A Nielsen study of more than 28,000 global consumers with Internet access found that among world regions, Asia-Pacific has been the quickest to adapt mobile social networking: Fifty-nine percent of audiences in that region use a mobile phone and 28% use a tablet to access social media. However, data extracted f! rom Goog le's Our Mobile Planet site also shows strong social networking activity among smartphone owners in parts of South America and Western Europe, as well as Southeast Asia. Let's take a closer look at Asia-Pacific, the largest and fastest-growing social media market. 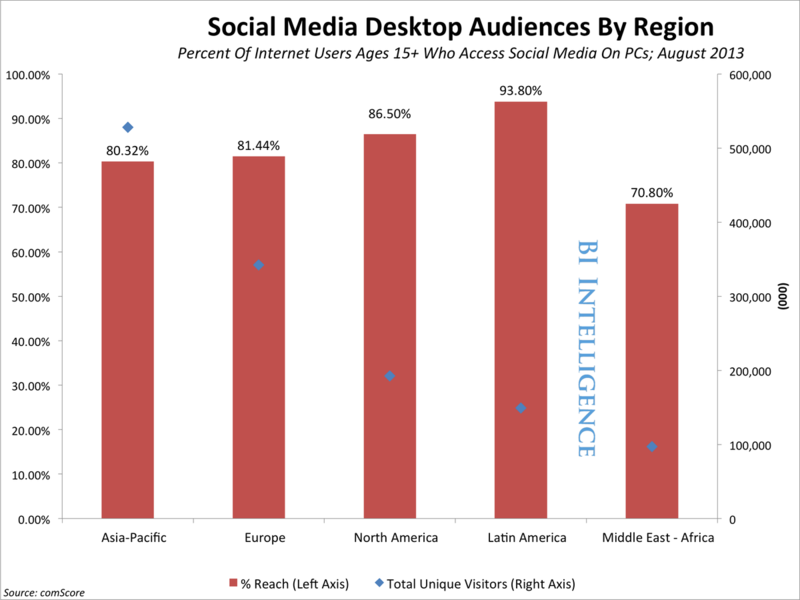 Asia-Pacific (APAC) has more social media users than any other region. More than 500 million people in Asia access social media via a desktop computer, meaning that 80% of the region's Internet population are users of social media on PCs. However, it is the popularity of mobile devices throughout APAC that represents the most significant growth potential for social media. According to Cisco, APAC nations will account for 47% of worldwide mobile data traffic in 2017. The top four mobile markets in the region — China, Japan, India, and South Korea — currently account for 60% of Asia's mobile connections. Thirty percent of Facebook's users are located in Asia; however, Facebook is not the most popular social network in the region's top social media market — China. China has enormous growth potential for social media. According to the Geneva-based International Telecommunications Union, China has nearly 570 million Internet users, which represents less than half of the country's total population. Information about social media usage in China is scarce, because of Internet censorship enforced by the ruling Communist Party of China. McKinsey & Company pinned social media users in China at 300 million in 2012. This number did not include people who were accessing Facebook, Twitter, and YouTube, because these sites are "banned," but many still find ways to access them. It's estimated that nearly 87 million Internet users in mainland China access Facebook via proxy servers and other privacy hacks. Thus, approximately 8% of Facebook's entire global user base comes from China. comScore reported in August 2013 that more than 300 million people in China accessed social media sites from PCs alone. The most popular social networks in China, according to data provided by GlobalWebIndex, are those featuring local language and content. Sina Weibo, a China-based social network that is akin to a Facebook-Twitter hybrid, is being used by 62% of China's Internet population on a monthly basis. Qzone, a China-only social network is used by 53% of China's Internet population on a monthly basis. Tencent Weibo, a microblogging service that limits messages to 140 Chinese characters or fewer, is used by 51% of China's Internet population on a monthly basis. Although local social networks dominate in China, Google+ is used by 23% of the country's Internet population on a monthly basis, making it the most popular social network in the country that doesn't have roots in China. Facebook is used by 21% of the country's Internet population on a monthly basis. 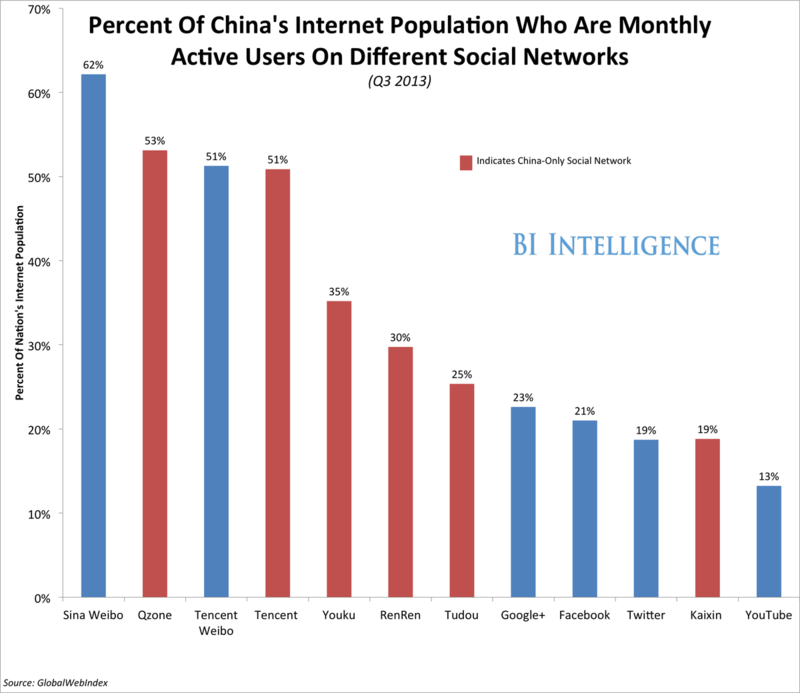 Social media activity in China is extremely fragmented by the many platform options. We simply do not see such high penetration rates for so many different social networks anywhere else in the world. 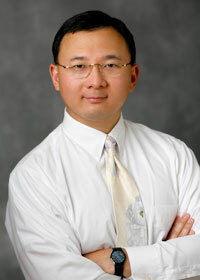 There are nine different main language groups in China (including Chinese, Tibetan, Mongolian, etc. 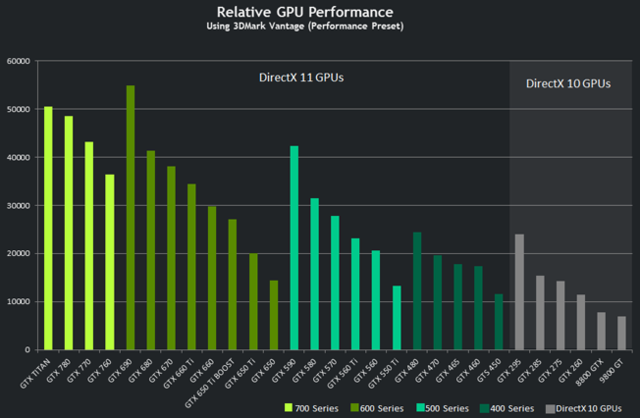 ), and this seems to have accelerated fragmentation. The most widely spoken language in China is Mandarin. But there are also many variants and dialects of standard Chinese, which makes social media targeting extremely difficult. Despite the large social media audience in China, the top social networks lack diversity in one sense: Five of the 10 largest social networks in the country are China-only social networks. Brands and advertisers can achieve a much broader spectrum of consumers via open social networks, such as Facebook, Google+, and Twitter. Other APAC nations enjoy a more cross-cultural experience on social networks. Facebook is used by 55% of the Internet population in India on a monthly basis, followed by Google+ (35%), and YouTube (33%). 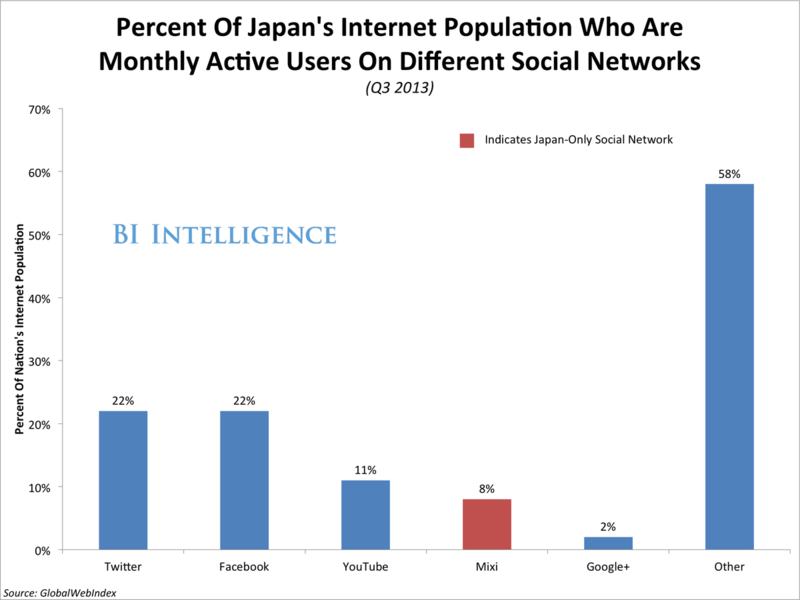 In Japan, Twitter and Facebook are the two most popular social networks, each being used by 22% of the Internet population on a monthly basis. As a daily habit, s! 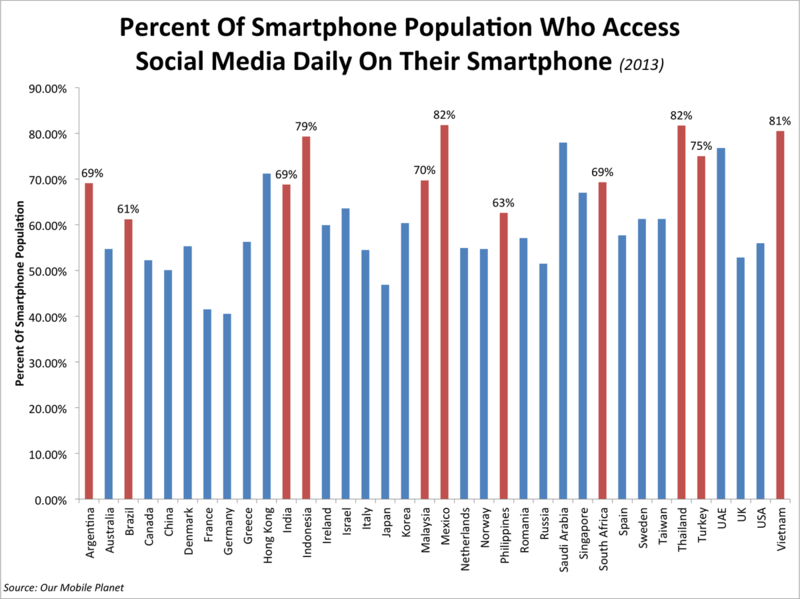 ocial me dia usage on smartphones is among the highest in countries in Southeast Asia. According to Google's Mobile Planet site, 82% of Thailand's smartphone population uses social media daily on their smartphone. We see a similar trend in Vietnam (81%), Indonesia (79%), Malaysia (70%), and the Philippines (63%). 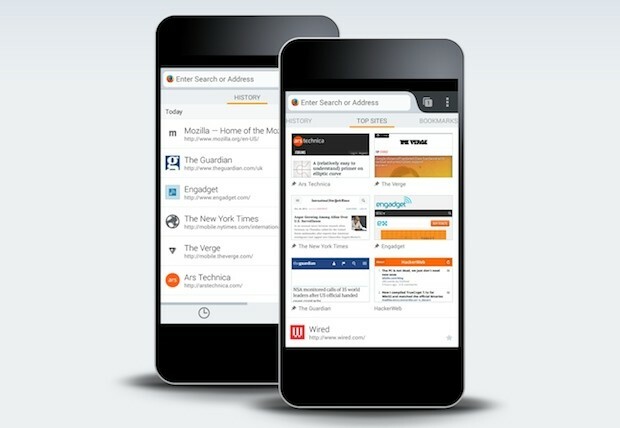 Social networks with a strong mobile presence, such as Twitter, will benefit from this activity. 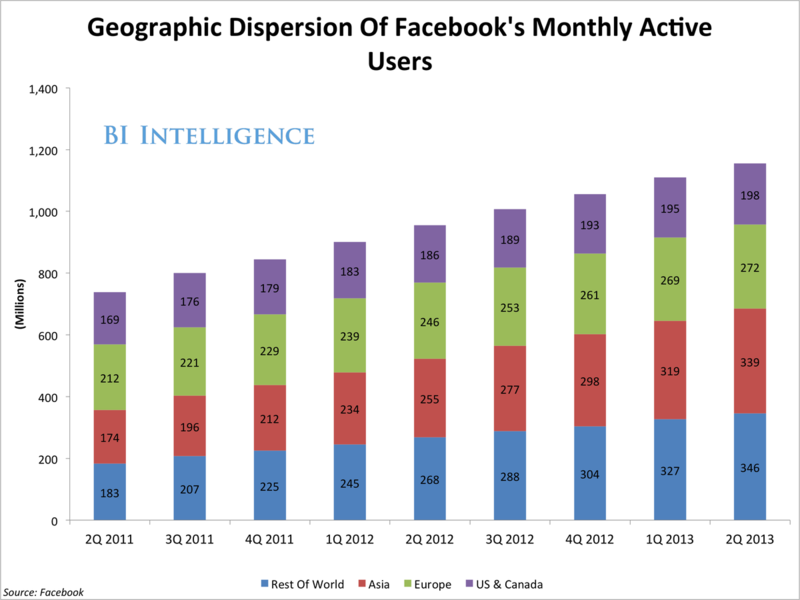 Facebook still has the largest user population at 1.16 billion monthly active users. YouTube is close behind with 1 billion MAUs. Qzone is running in third place at 712 million total users. It's twice as large as global social messaging app WhatsApp and nearly three times as large as Twitter. Many of the Western world's social networks are increasingly international. For example, 86% of Facebook's users are outside the United States. 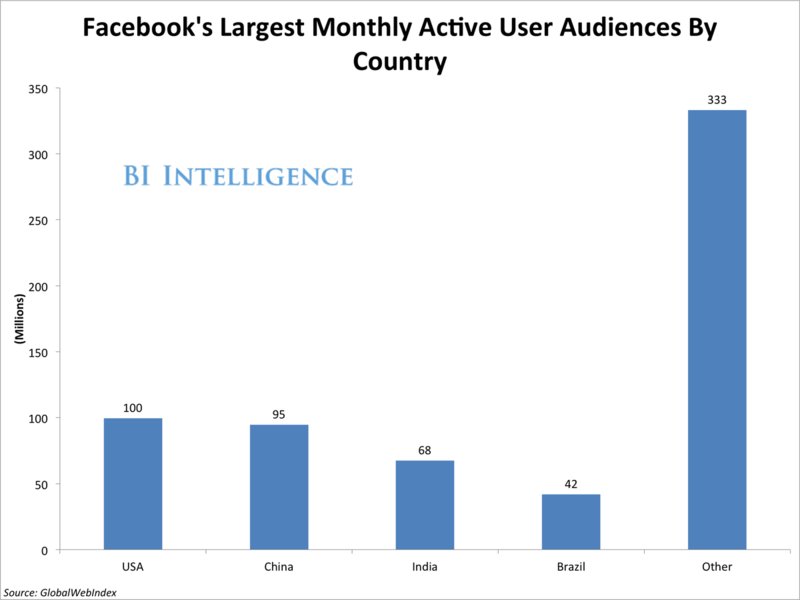 Facebook is now as big in emerging markets as it is in the U.S. It has 68 million users in India, and 42 million in Brazil. Google+ and LinkedIn have more Indian users than Americans. Despite being blocked in China, the major social networks still have many millions of Chinese active users who use various hacks to gain access. LinkedIn, the only major social network that is not blocked in China, has more than 20 million users in the country.